Ogo stands for "Oh, Go Outside." These construction sets are meant to be built outside but can be played inside, as well. With the OgoBild Nexus -- all attachments are interchangeable, so you can build parts from the Nexus set to the Pod Set and vice versa. Dimensions (in packaging): 2.5" x 12" x 9.25"
One grand daughters birthday gift, but both girls just love building structures with this. They are 4 and 6 years old. I bought this for my grandson who loves to "tinker" and it keeps him occupied. OgoSport develops fun, flexible toys that inspire creativity, encourage active play, and lead to lots of experimentation and problem-solving. And best of all? They do it without screens, batteries or controllers. That’s critical to the original founders of OgoSport, Rick Goodwin and Kevin Williams, who were committed from the beginning to making toys for all ages that foster open-ended exploration. We’re featuring two brand new OgoSport sets that look very different from each other but share the same core construction element: OgoSport’s bouncy rubber ball joint. It has sockets that you can plug with all sorts of funky attachments and structural connectors. The OgoBild Pod set includes 12 BILD balls and 30 ball-to-ball connectors that can be assembled into flexible structures such as forts, rockets and cars. Throw a sheet over one of your structures and it’s an instant personal tent. 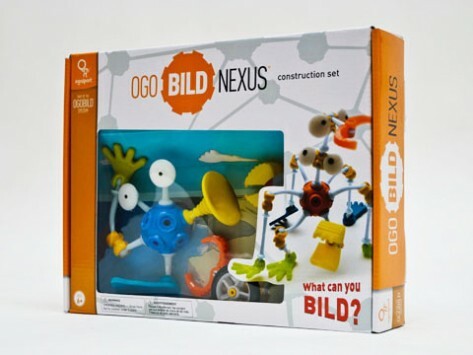 The OgoBild Nexus set enables more sculptural creations. You can combine the 4 BILD balls and 95 attachments in any arrangement you can think up, creating robots, creatures, and unpredictably bouncy balls with crazy appendages. All the attachments are interchangeable, so kids (and you!) can set your imagination free and just start creating.